Roku says it supports MKV. But many people have been having some issues with certain MKV files playing using the Roku Media Player What happens is that at certain points while playing the MKV file there will be a slight blip and after that blip you will no longer get audio. Another case, when you play MKV file on Roku Ultra via USB , they constantly stutter and skip as if they are in slow motion. There are many cases in forums, let’s see what’s happening arround us. "So I just bought a roku ultra a few weeks ago. Haven’t used it until today. I went and found an old hard drive filled with mkv’s. Some of them work, but others keep saying ‘file corrupt or damaged’, which it’s not since they work perfectly fine on my pc using vlc or something else. If my main goal is to play local content, and I don’t care much about streaming, should I have gotten an WD TV Live player instead? Or should I start converting all my mkv’s into some mp4 format that is compatible with Roku? I guess those are my two options.." ——Question from Reddit. Rokus can be picky on formats and codecs on not just video but audio as well. The cheapest and easiest option would be to convert all videos to H.264 MP4 with AC3 audio. You must come up with a new question again, what video formats does Roku Ultra support? Well, easy, read on. The Roku Media Player channel will not display unsupported file types or files it has determined cannot be played by your Roku device. DRM-protected content is not supported. Roku Ultra USB Media Player channel only plays MKV files encoded with H.264 video codec. If the MKV is encoded with other video or audio codec like MPEG-2, WAV and etc, we will fail to play MKV on Roku Ultra via USB drive, SD card or external HDD. And there is also some saying Roku 3 does support MKV but @30 fps, maybe that’s another reason for the problem. Now you have find the way out like the men mentioned in that question above, the best and cheapest way must be converting all your MKV file with any video audio codec to Roku Ultra supported H.264 MOV, H.264 MP4, or H.264 MKV. Most MKV files have a 5.1 surround sound audio track, but this kind of audio track would be damaged or lost on Roku Ultra. In order to enable AVI, XVID, H.265/HEVC, MKV with 5.1 audio, MXF, FLV, and more video files for playback on Roku Ultra, Pavtube Video Converter Ultimate | for Mac you deserver. ThisRoku Ultra MKV Converter allows you to converter covnert any MKV video you get from everywhere to H.264 MP4/MOV/MKV with just 3 steps, with it, you don’t ever worry about the video/audio settings anymore. In addition, you can edit video clips, such as trimming, cropping, splitting, merging several parts into one, adding external subtitles. Click "File" to add the MKV file you want to convert from your folder, or you can directly drag or drop the videos into the program, then you can preview in the right "Preview" window. You are allowed to import many MKV into this application at a time, cause batch conversion is available here. Click "Format" bar, navigate your cursor to "Common Video", select "H.264 MP4(*.mp4)" from its submenu. 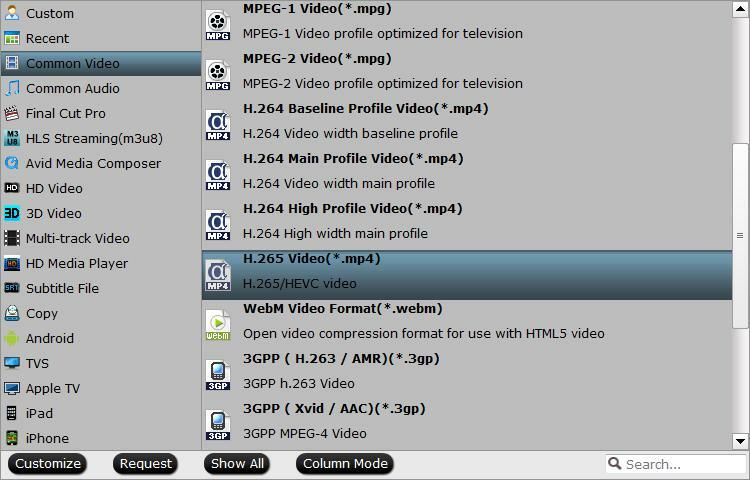 Or you can choose MOV, MKV with H.264 codec as you like. 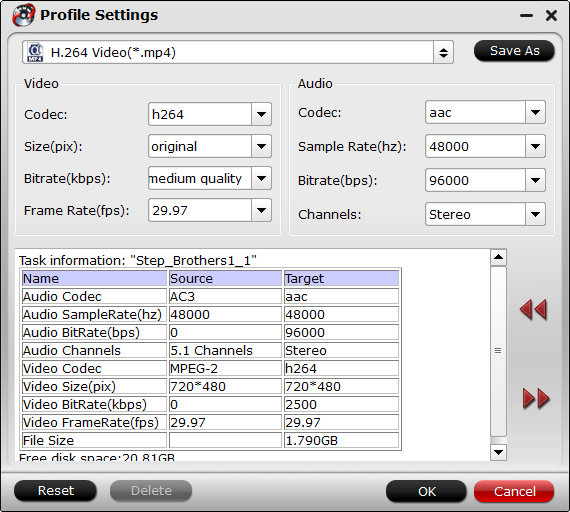 Tip: In its "Profile Settings" window, you are allowed to customize video parameters like: video codec, frame rate, bit rate, rasolution, sample rate, channels to make the generated file more fit with your Roku Ultra. After you have done all settings, return to UI and hit the red button Convert to start the conversion, during the conversion process, make youselves a cup of tea or coffee and enjoy the day. When it is over, go to output folder to get the converted file. Now you can transfer the MKV to Roku Ultra with USB drive, SD card or external HDD for enjoyment without any curbs. How to Solve can’t Play MKV files on Panasonic Viera TV? Why MKV can’t be played on Philips TV? How to Play MKV on Philips TV? MKV to Google Pixel: How to Play MKV Movies on Google Pixel? Is there a way to play .mkv files on Chromebook? How to play 4K videos on TCL P-series Roku smart TV?